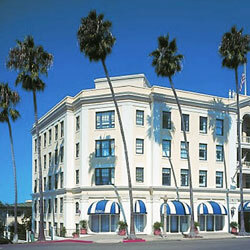 Cape Town Pub is located on Miramar Road near Marine Corp Air Station Miramar in central San Diego. 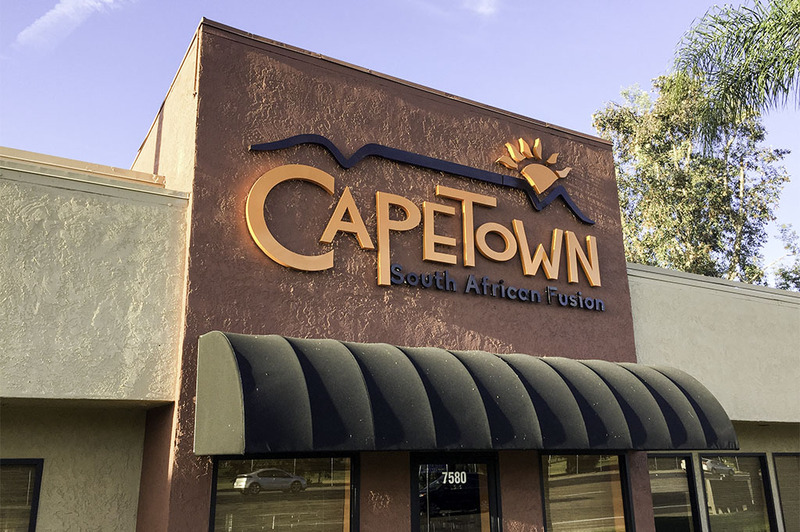 Eating here was a new experience for me as I don’t recall having ever tasted truly authentic South African Cuisine. Authentic is an understatement. Funny enough, our waiter was amazed at how much we ordered. He commented that he had never seen two people order so many items just for themselves. 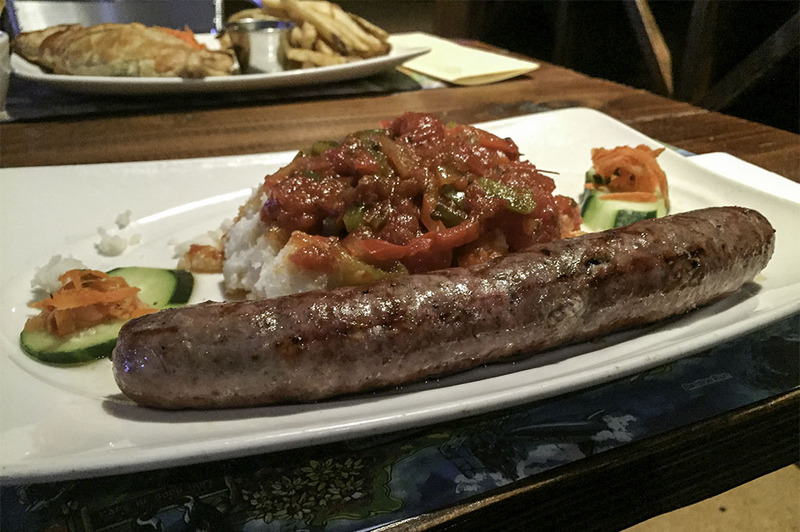 The craft beer was flowing and this new South African food I was experiencing for the first time was exciting! “Keep it coming!” I said. What other exotic foods that I’ve never tasted are on the menu? When you walk into the restaurant, you know you aren’t in your average San Diego establishment. 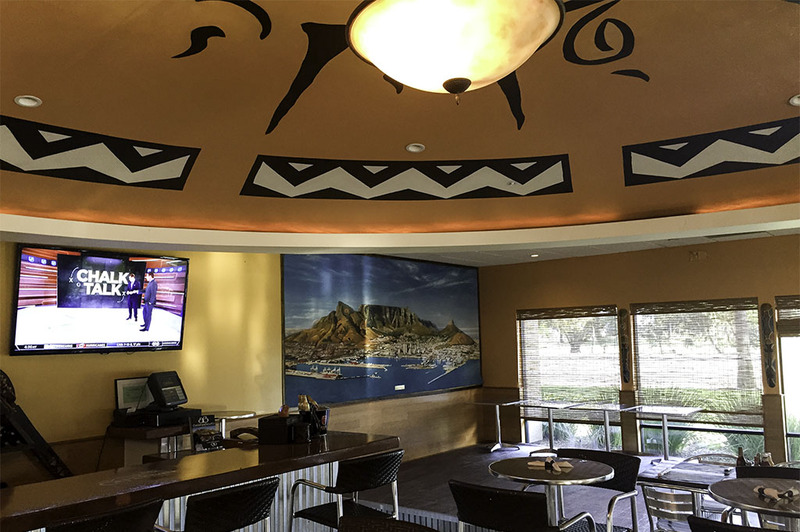 The place is huge and decorated to the tee in order to give you a unique South African experience. 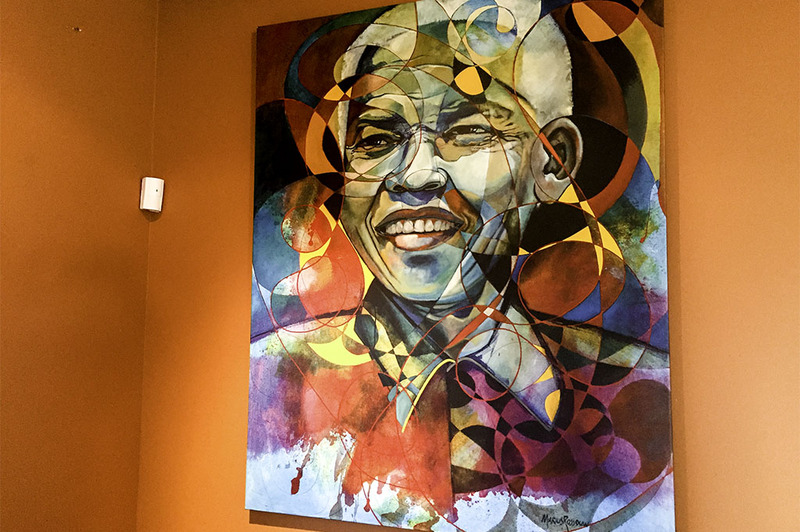 There are flags, paintings, art and even a small market where you can buy those hard-to-get items you won’t find at the grocery store to take home. 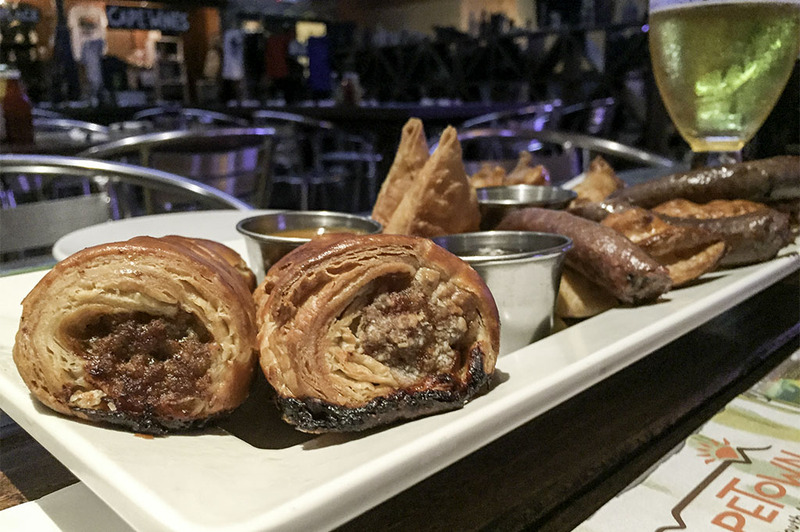 Let’s say Cape Town Pub has a little bit of everything. 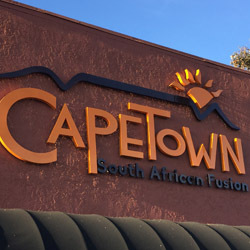 Cape Town Pub is not just a restaurant; it is where the local community gathers to be social, tell common stories and connect with like-minded friends. You can watch sports matches that won’t be on in most sports bars in San Diego, like rugby, soccer, cricket and, of course, surfing and golf. All with that craft beer flavor only San Diego can provide. 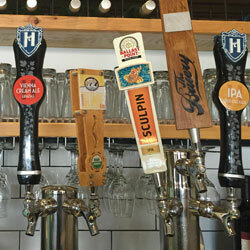 You’ll find lots of new local taps every time you visit the Cape Town Pub. And that puts a smile on this guy’s face! Let the match begin! 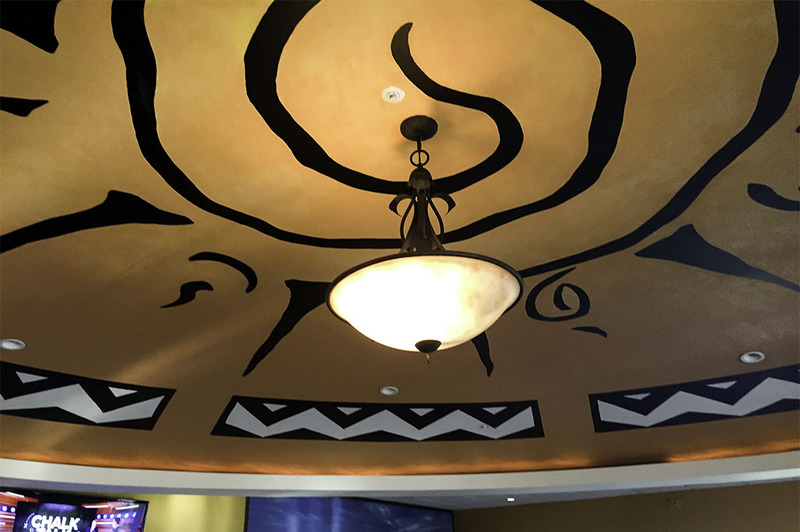 Eating here is a true South African experience. Now, since I had no idea what I should order and couldn’t even pronounce the menu items correctly, I just asked our waiter, who was quite knowledgeable (and seemed to get a kick out of how clueless we were), what the different menu items were. This is how we started getting pretty off track. Every time he told me about something, I was like, yeah! We gotta try that! 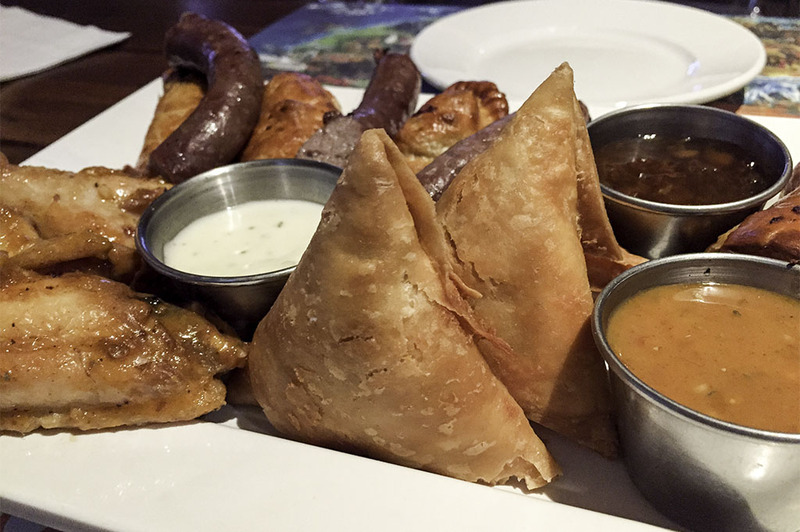 So, first up we ordered a Cape Town Lager and a Sampler Plate, a great way to enjoy Cape Town’s treasures. 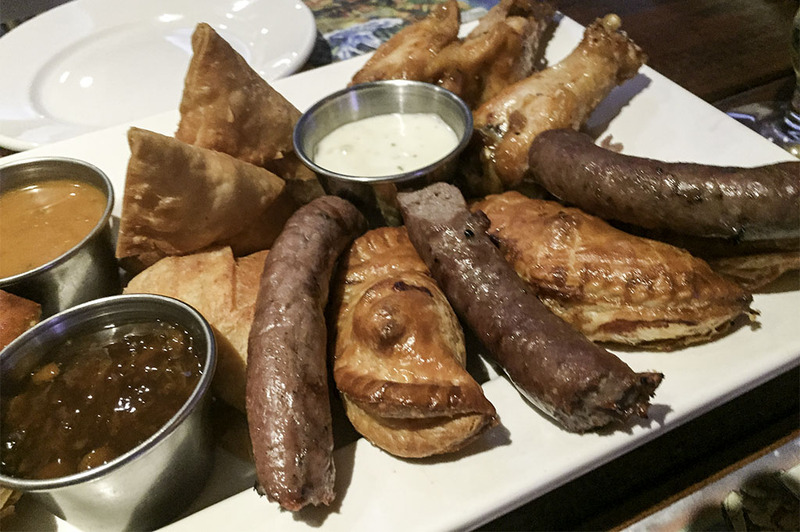 The Sampler comes with: 3 Samosas (potato, chicken and beef), 3 Peri Peri Wings, 3 Cocktail Pies (ingredients vary from day to day), 2 Sausage Rolls and House Made Cocktail Boerewors. 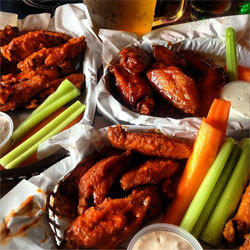 Take a look at the photography and see how delicious they all looked. 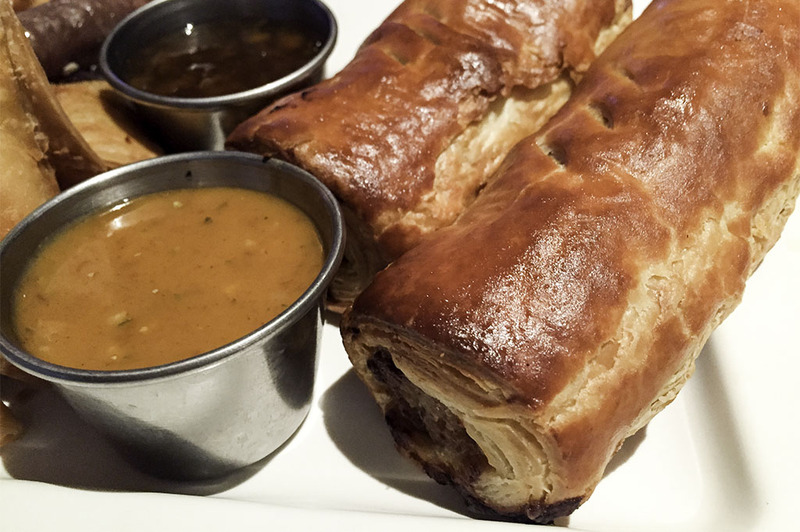 The Peri Peri wings were wonderful and the sausage rolls dipped in the house sauces were nothing short of amazing, wow! 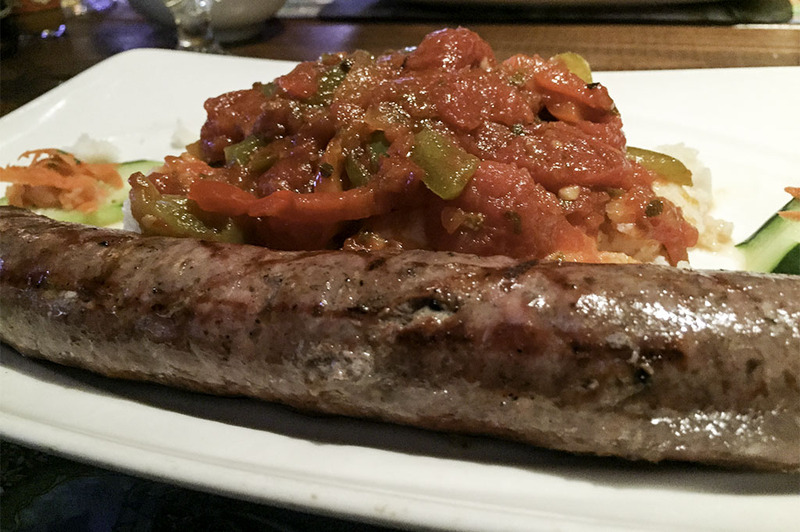 The Cocktail Boerewors were little sausages that were full of flavor. I definitely recommend you get the Sampler, but it really feeds 4, ha! Not this time. 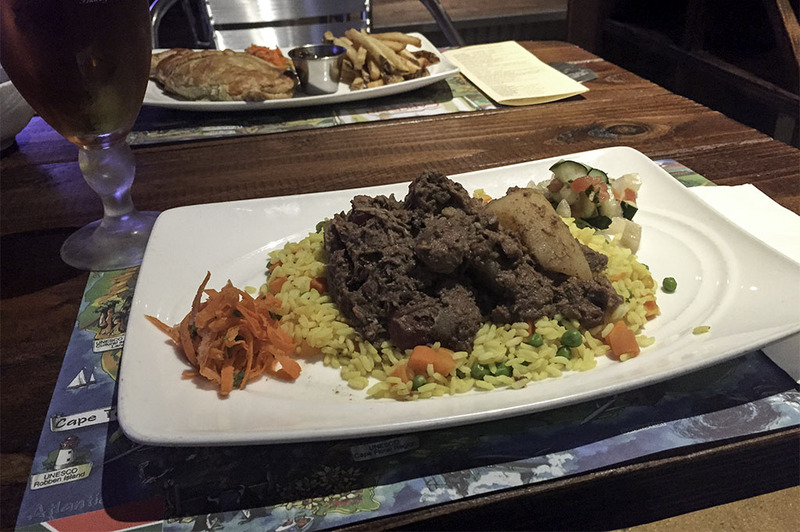 We also asked for a side of Biltong, as if we needed more sides of beef with our South African feast! Essentially, Biltong is a South African-style dried beef jerky and, just like in the States, it tasted great! We even bought a bag to take home! 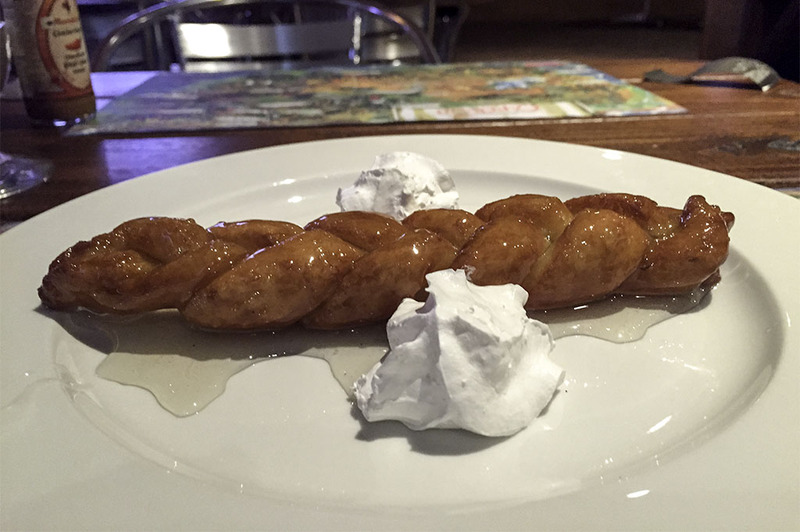 We tried another appetizer, which I believe was actually an entrée. 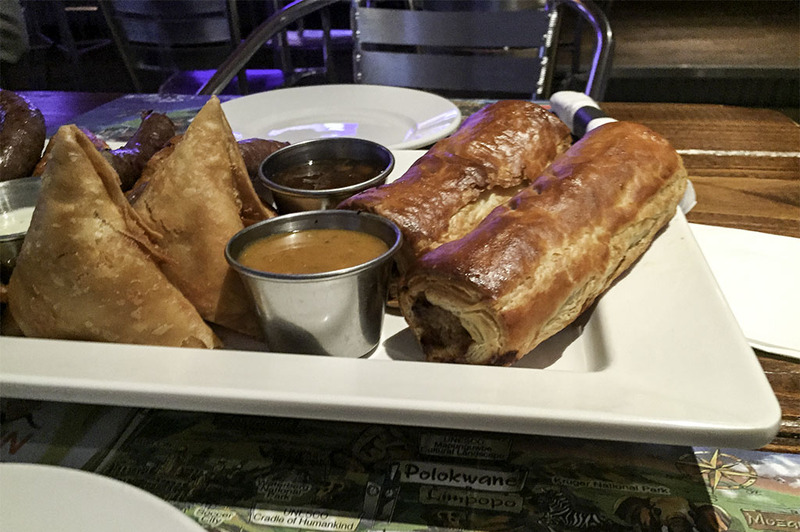 From what I gather, every South African restaurant has its own signature gourmet pie which they make fresh daily. Cape Town Pub is no different. 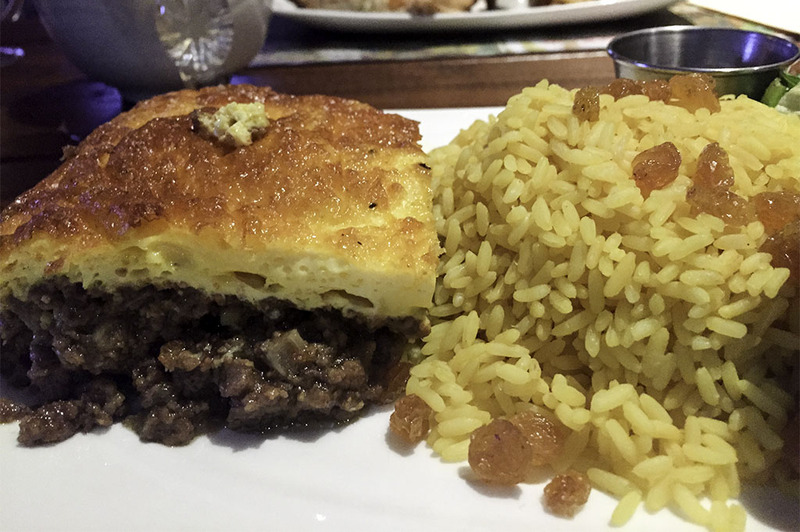 We had the Spinach and Feta Pie, which is Cape Town’s Signature Savory filled pie. 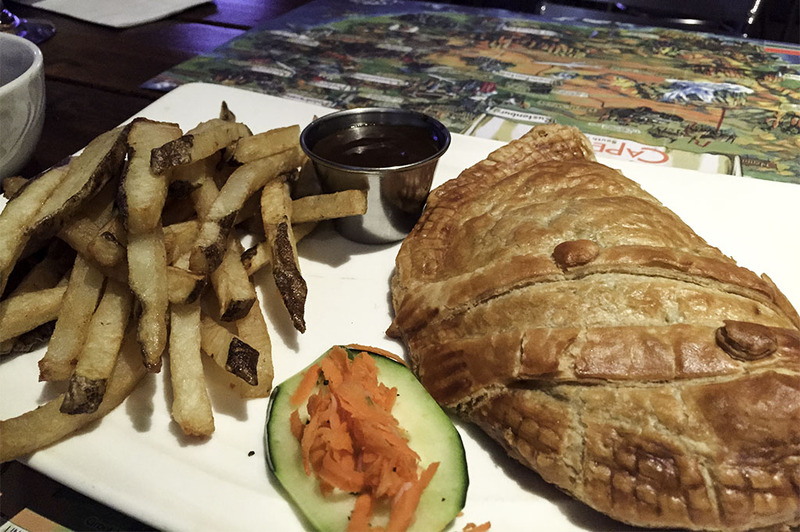 It was prepared and baked to perfection in a flaky golden brown crust. The flaky pastry literally shattered in your mouth as you bit into it releasing a wonderful buttery taste just before the robust spinach and feta flavors kicked in. A beautiful thing! Now, for the entrees! This is where I started to feel a bit nervous – was my stomach up to the task? 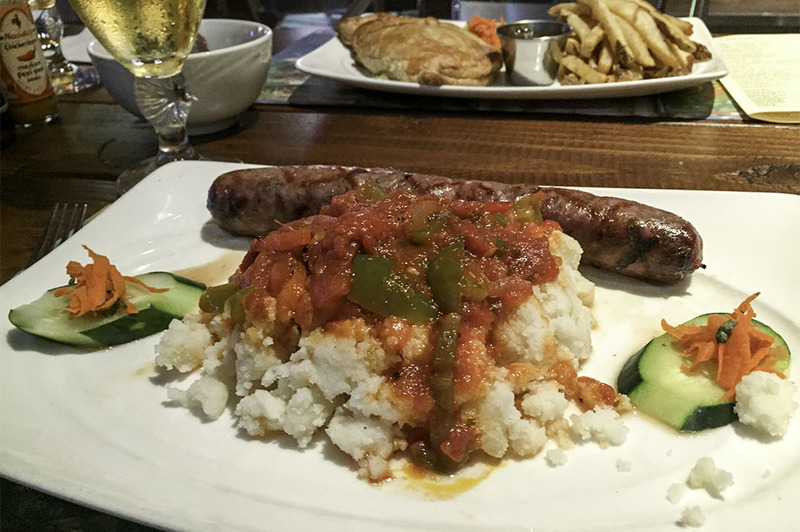 South African Cuisine has so many cultural influences and, come to find out, is really hearty. I literally slept for hours after stuffing myself to the point that I almost had to pass on dessert. I said almost. The two of us ordered 3 entrees and shared them like a family-style dinner. More like family of 4. We had Durban Signature Curry with Lamb. The dish was a slow-cooked curry seasoned with a personal blend of herbs and spices. It was served with a bowl of Yellow Rice, Carrot Salad and Sambals (a mixture of chopped cucumber, tomato and onion). The flavors complimented each other so well. 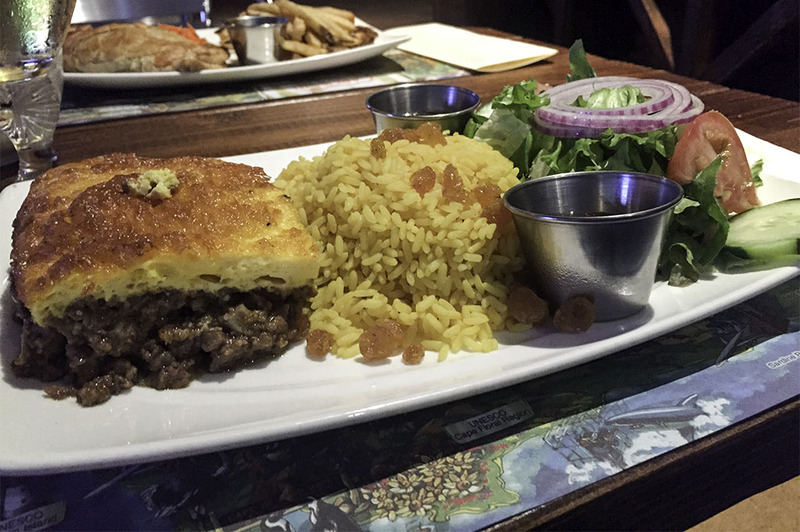 We also enjoyed South Africa’s National Dish, Bobotie. 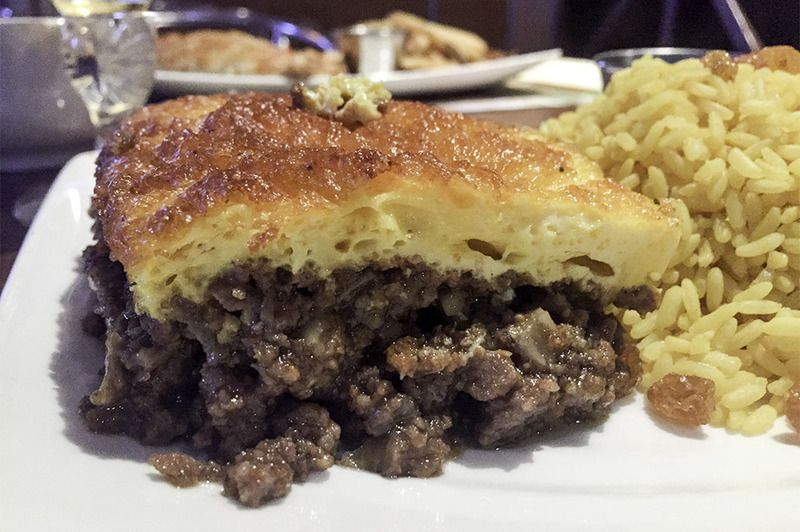 This sweet and savory mixture was composed of ground beef, walnuts, raisins and apricots and topped with egg custard. 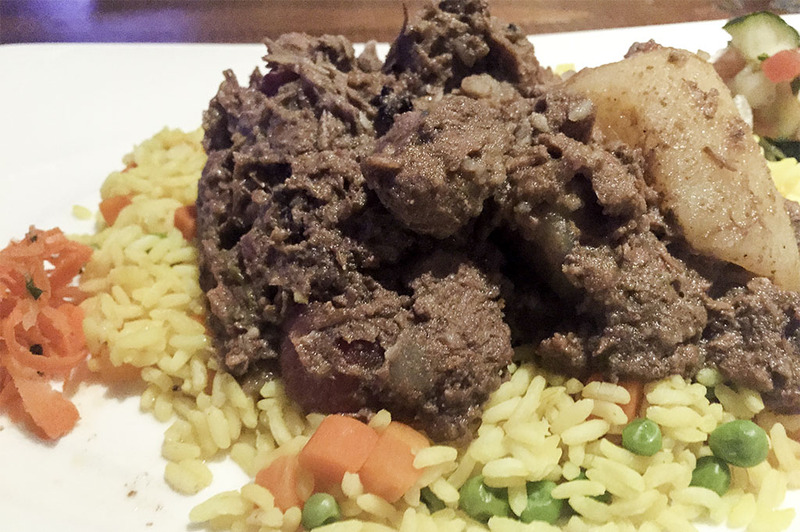 This dish came with Yellow Rice, was garnished with raisins and served with a side salad. 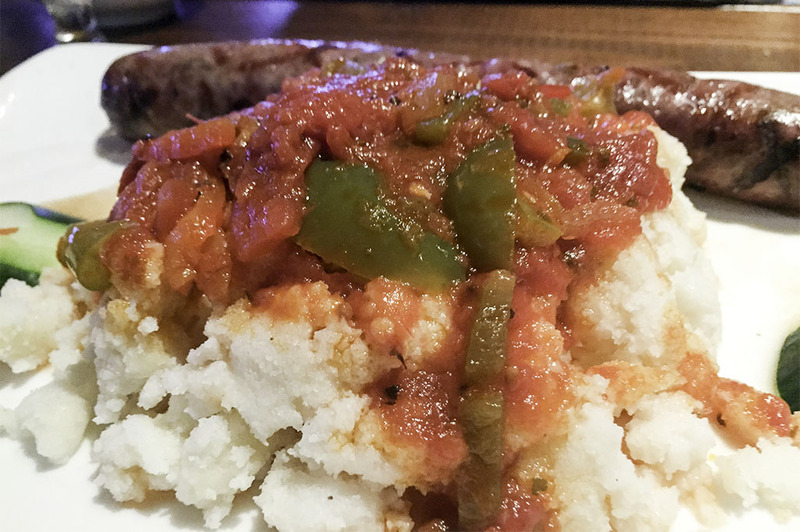 Next up was Boerewors Pap and Gravy: a house-made sausage (made from a mixture of pork and beef) served with Pap – South African-style polenta made from ground maize and complimented with tomato and onion gravy. All three dishes were absolutely delicious! I recommend you try a number of different dishes and share them or just pick the one which interests you the most. You in for treat no matter what you choose to do. At this point, to be completely honest, I couldn’t fathom another bite, but that has never stopped me from enjoying dessert before. I like to finish a meal with that sweet taste! 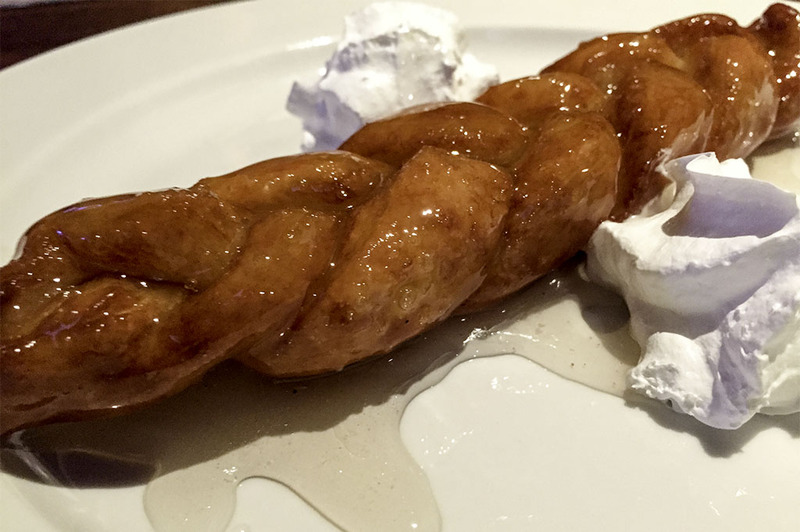 So, I ordered the Koeksusters, a traditional South African deep-fried braided doughnut smothered in sweet and zesty syrup. Words can’t describe it; I’m sure you will enjoy it more by viewing the photography and tasting it for yourself. Imagine what those flavors taste like. Multiply that by ten and you will get pretty close. I don’t watch much cricket, but I think I could take it up. The crowd at the Cape Town Pub are a lively bunch and share the same love of food and craft beer as we do at Good Eats San Diego. This is a match made in heaven. Like our ex-governor once said, I’ll be back!